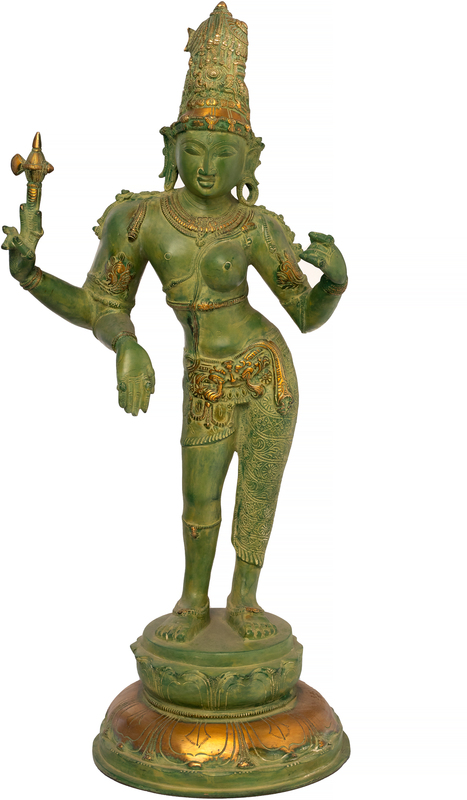 The Ardhanarishvara is the most telling deity of Hindu philosophy. It is a confluence of purush and prakriti, of the male and the female, of energy and matter - an idea expressed exclusively in Indian philosophy. It is a powerful symbol of existence as a process. Two halves each of Shiva and His wife, Parvati, meet to strike a figure that has all the grace of the feminine and the wrath of the masculine (lasya and tandava, respectively, as in the dancing Ardhanarishvara). This Ardhanarishvara, that comes in a motley of variations to suit your space, has a towering jatamukuta to set off the dangling karnaphool of Parvati. The androgynous countenance bears a composure of transcendental bliss. While the silhouette juts out in the shape of a broad shoulder on Shiva's side, it descends into a soft curve on Parvati's. Note the finesse of Her fingers, giving it away that She plays some divine melody on Her veena. One of Shiva's hands rests on the back of His trusty Nandi, a popular stance of the deity, while the other holds up the goad of dharma. Luxuriant adornments, starting from the neck to the navel, wind around the undulations of the torso that is skilfully carved in accordance with the essence of each deity that makes up the composite. While the hem of Shiva's dhoti lies mid-thigh, leaving the glorious musculature of His limb exposed to the devotee's view, Parvati's supple shape is draped over till the distinctly narrower ankle. Each of Ardhanarishvara's wrists and ankles is clad in bangles. The one-of-a-kind pedestal of this sculpture makes this a must-buy. With the usual lotus petal motif etched on to the surface, it is like a circlet of freshly plucked lotuses placed atop a gigantic inverted one.